The Boston Market Squash Casserole is delicious, now you can recreate their famous squash casserole at home. Are you looking for a good side dish? 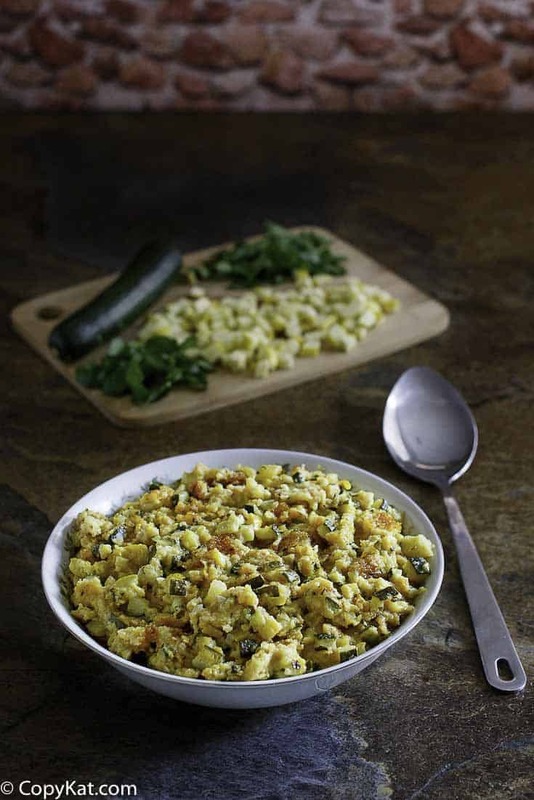 If you love squash, this may be the perfect recipe for you. This Boston Market menu item is made with basic ingredients you can buy at the grocery store. 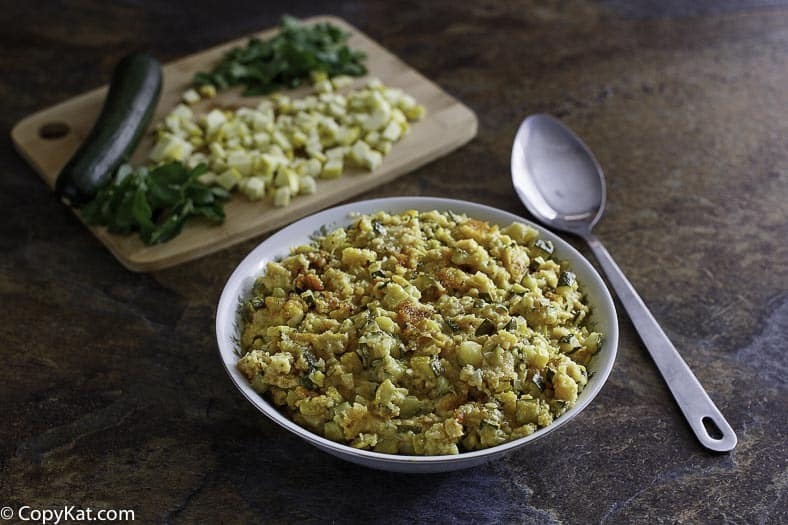 This casserole is made with squash, zucchini, cornbread mix, onions, and more. This copycat recipe for Boston Market Squash Casserole makes several servings so this is perfect for a large gathering. You can make this casserole ahead of time. If you cook this casserole completely and then allow it to cool, you can store this in the refrigerator, and reheat when you need to serve this recipe. Be the hero at dinner when you make the Boston Market Squash Casserole recipe. Prepare Jiffy Mix as directed, set aside to cool. 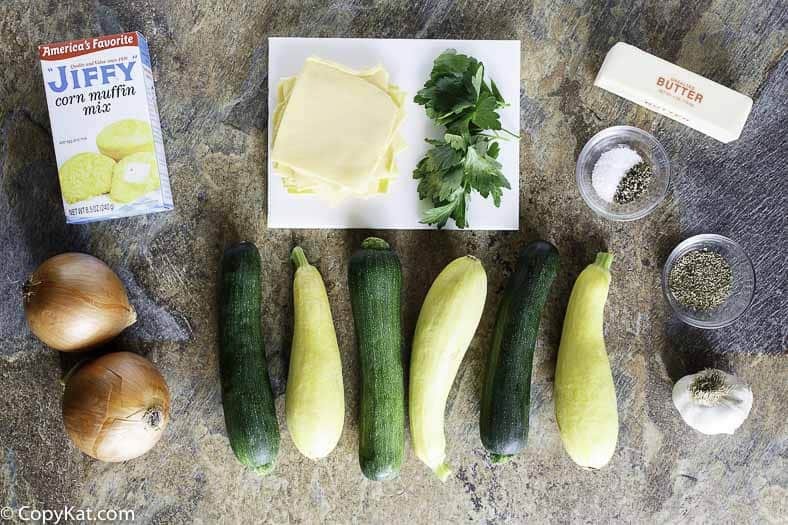 Place zucchini and yellow squash in a large saucepan and add just enough water to cover. Cook on medium-low heat just until tender, remove from heat. Drain squash, reserve one cup of water for a casserole. On medium, low-temperature place all of the butter in large saucepan and saute the onions until the onions turn clear, add salt, pepper, thyme, and parsley. Add chicken bouillon cubes and garlic to onions, stir. Add drained squash and diced cheese, stir. Crumble cornbread in squash and pour the reserved cup of water and mix well. Place squash mixture in a 13"x11" baking pan that has been sprayed with a nonstick spray. Cover casserole and place in a preheated oven at 350 degrees. Bake for 50 - 60 minutes. Remove cover the last 20 minutes of baking time. We found that this casserole is a great replacement for stuffing or potatoes. I used Olive oil instead of butter and for a lil more flavor I also put a dash of sage and poultry seasoning. I also used chicken broth instead of water. Just the way I remember it, DELICIOUS!!! Thanks Copykat, you’ve pulled through again! I am so glad you liked the dish! Just the way I remember it, DELICIOUS!!! Thank Copykat, you’ve pulled through again! This is honestly a great recipe… I make my own cornbread on the side to cut back on sugar…and I use a higher corn meal to flour ratio. Other than that, this recipe is spot on. It’s so forgiving. I have always used sharp cheddar. I mix some in with the squash and put a lot on the top…and I take little pinches of it and stuff it randomly in the casserole so there’s always a good bite of cheese in every serving! Being creative, I have also made a vegan version to this! Thank you for the recipe! MUCH APPRECIATED!!! This isn’t Boston Market Squash Casserole, this is Cheesy Goodness. If you haven’t tried this you don’y know what your missing!!! Would this work if I prepared it all ahead, refrigerated it, and put it in the oven just before serving? I wouldn’t prepare this too long ahead of time the squash may dry out. This is THE ONLY squash casserole recipe I will use from now on!! It turned out Sooooo good!!! Thanks Sondra, I am happy to hear you enjoyed this recipe so much. This totally tastes just like Boston Markets. I halved the recipe and realized that you can probably use less butter, but amazing taste, a definite a repeat recipe. This looks good but can someone tell me how many people it serves. Thanks in advance for you input. It feeds about 8-10 people if you’re doing a healthy serving size (1/2 cup maybe), but my husband can eat half of it by himself – he loves it that much. So 6 people if the servings are bigger (1-1 1/2 cups). We always have left over, but I did make it in shallow baking pans once for a party – got 3 pans out of it, party of 20 people ate it. I’ve been making this for about 7 years now. The only difference is that I use only yellow squash and cut out the zucchini all together. I cannot tell you how often I get requests for this dish. Anytime there’s a potluck, I am asked to bring this. I actually get requests from passengers who ride my husband’s bus to please make this so he can share it them. It is addicting and a fantastic addition to our Thanksgiving dinners every year. Commenting on my own comment….I also changed out the cheese to Sharp Cheddar. It works better with the yellow squash. Copykat is the best! This recipe tastes exactly like the casserole at Boston Market! Thanks!